This travel agency complaint letter cites unprofessional behavior by an employee and demands redress. 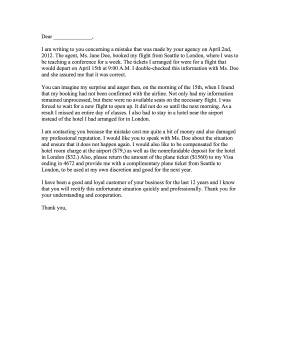 I am writing to you concerning a mistake that was made by your agency on April 2nd, 2012. The agent, Ms. Jane Doe, booked my flight from Seattle to London, where I was to be teaching a conference for a week. The tickets I arranged for were for a flight that would depart on April 15th at 9:00 A.M. I double-checked this information with Ms. Doe and she assured me that it was correct. You can imagine my surprise and anger then, on the morning of the 15th, when I found that my booking had not been confirmed with the airline. Not only had my information remained unprocessed, but there were no available seats on the necessary flight. I was forced to wait for a new flight to open up. It did not do so until the next morning. As a result I missed an entire day of classes. I also had to stay in a hotel near the airport instead of the hotel I had arranged for in London. I am contacting you because the mistake cost me quite a bit of money and also damaged my professional reputation. I would like you to speak with Ms. Doe about the situation and ensure that it does not happen again. I would also like to be compensated for the hotel room charge at the airport ($79,) as well as the nonrefundable deposit for the hotel in London ($32.) Also, please return the amount of the plane ticket ($1560) to my Visa ending in 4672 and provide me with a complimentary plane ticket from Seattle to London, to be used at my own discretion and good for the next year. I have been a good and loyal customer of your business for the last 12 years and I know that you will rectify this unfortunate situation quickly and professionally. Thank you for your understanding and cooperation.